The front door of a home that's been condemned by the city. This home in La Mesa was condemned by the city last September. The La Mesa neighborhood east of the fairgrounds has more abandoned properties than any other part of Albuquerque. Juan Francisco Lopez can pinpoint some of them in an instant. After living here for nearly 20 years, he has a sort of mental map. "There’s one right up this street. They tore the door off so they could get in and I see people coming and going. Homeless, guys who are up to no good," he said. "There’s fewer [abandoned houses] than there used to be. There’s not very many now." 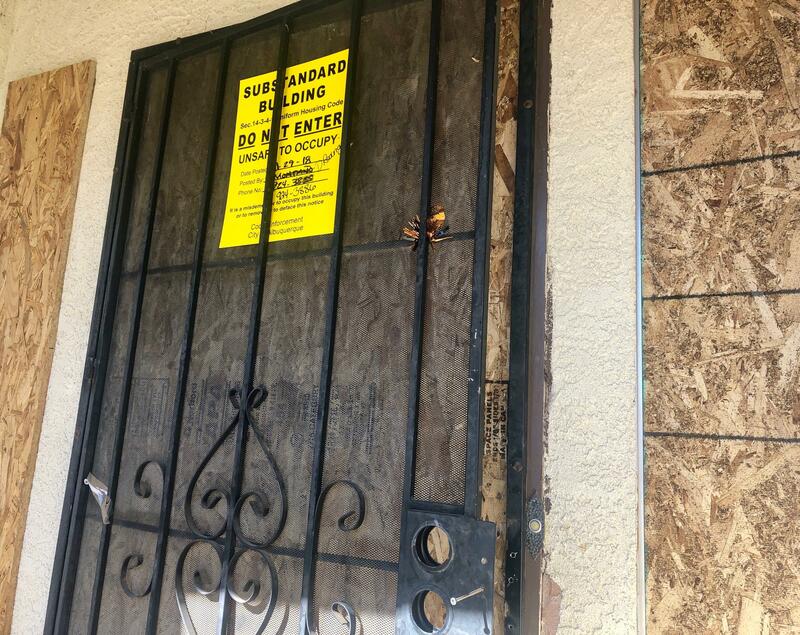 A house near Juan Francisco Lopez' home has been boarded up and condemned by the city. Lopez said there used to be so many more deserted homes back in the 80s and 90s. Even though there's fewer now, he said that doesn’t mean he’s okay with them. He said the neighborhood needs to be revitalized. City data show that the neighborhoods with the most run-down properties are all in or around the International District in Southeast Albuquerque. A group of 17 neighborhood associations there are leading the charge to change that. Gina Naomi Dennis is president of the District 6 Coalition of Neighborhood Associations. "Some of these properties are literally rotting through the foreclosure process. Others have just been left abandoned by individual owners. We have come up with a solution," she said. The coalition has teamed up with other local groups to identify abandoned homes then rehabilitate and sell them. She said the project helps connect people with affordable housing while improving things for existing residents too. "People have a right not to have to feel afraid," she said. "They have a right to have a home that appreciates in value, that does not plummet. They have a right to have a good life." She said the group decided to take action because the city can’t do more than condemn a house. And that’s true - the city can file liens on properties and issue fines to try to get the owners to fix things up. A spokesperson with the city said they don’t buy properties to rehabilitate them. But a local company named Homewise is purchasing abandoned properties, fixing them up and selling them. 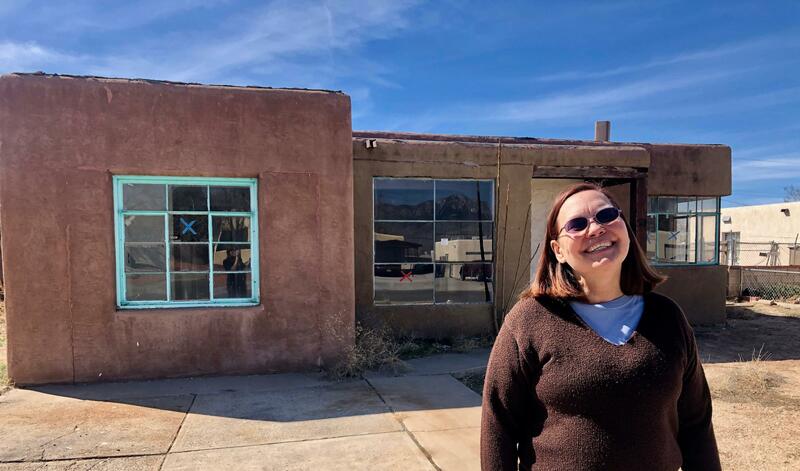 They have offices in Santa Fe and Albuquerque where they are working with the District 6 Coalition to advise and assist low-income folks with buying a home. Elena Gonzales is director of the company’s Albuquerque operations. "We want to take this holistic approach to a healthy neighborhood and making sure the residents that live there are cared for and they have the exact same resources everybody else has to be able to stay there," she said. Gonzales said buying these properties is going to be the tough part, mainly because some of them are owned by banks, not by individual people. That means there are a few more hoops to jump through. But they’re determined. "We want to help the neighborhood get stronger, safer and better," she said. Sandra Singer stands in front of an abandoned house near her home. Sandra Singer is looking forward to having new neighbors. She lives in the area, across the street from an abandoned house. "There were clothes everywhere, there was just general chaos going on which tells you that nothing good’s happening in there," Singer said. That was a few months ago. She said things have really calmed down lately, but that house and several more a few doors down are just sitting there, vacant. One of them has a yellow city condemnation notice on the door saying it’s substandard and unsafe to occupy. "That’s about what I’d expect for a house that people weren’t exactly living a life that was good for ‘em," Singer said. She used her veteran’s benefits to buy her first home here three years ago and she’s glad that somebody is stepping in to improve things. "It gives me hope that people are finally caring enough for one another that they’re willing to spend the money to have it happen. Because it lifts us all up," she said. She’s excited to see those empty houses filled with life because she’s gonna be looking at them for a long time. Let's Talk New Mexico 2/14 8a: Many people across New Mexico experience homelessness or housing insecurity. We'll look at how local governments and other organizations are working to help those folks get back home. There are immediate needs for some people, but what about long-term solutions? What are the most effective ways to help people get housing? Have you experienced homelessness? What worked best for you? Email LetsTalk@kunm.org, tweet us using the #LetsTalkNM hashtag, or call in live during the show.